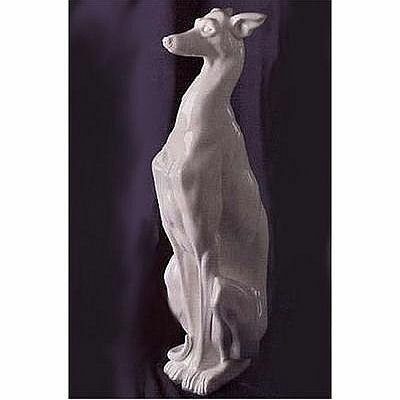 Our outstanding greyhound statues are designed with a great deal of artisanship and are based on European originals. Life size and life like, these statues will set a prominent statement anywhere. Beautifully handcrafted and hand finished. There are two types of greyhounds recognized so far. The American Kennel Club (AKC) type is much taller and narrower than the National Greyhound Association (NGA) type. The AKC type is also characterized by having longer necks and legs with a more arched back. NGA greyhounds may not have as much a muscular body but they will run faster than the AKC type. In terms of coat, both types maintain smooth, short coats in various colors of blue, black, white, red and liver. However, the NGA type may have thicker coats with a possibility of developing hair loss around the thigh or leg areas.